Do you know the history of led filament bulbs? A LED filament type design light bulb was produced by Ushio Lighting in 2008, intended to mimic the appearance of a standard light bulb. Contemporary bulbs typically used a single large LED or matrix of LEDs attached to a large heatsink. As a consequence, these bulbs typically produced only a 180 degree range of light. By the mid 2010s, LED filaments were being introduced into the market by several manufacturers. These designs used several LED filament light producers arranged in the same or similar pattern to that found in the wires of a standard incandescent bulb. 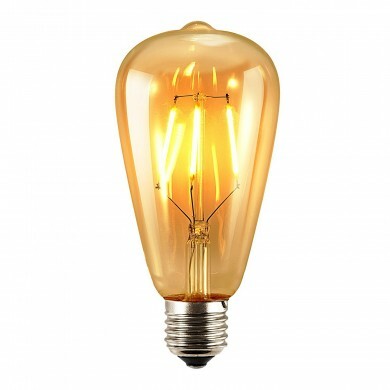 LED filament bulbs look just like their traditional incandescent counterparts thanks to a unique new LED technology that allows for very small LED emitters to be arranged in a linear filament style package. These emitters are then powered using a traditional glass insulated circuit similar to that found in a traditional incandescent bulb. The end result is a bulb that functions and looks virtually identical to an incandescent. The LED filament is composed of a series of LEDs on a transparent substrate, referred to as Chip-On-Glass (COG). These transparent substrates are made of glass or sapphire materials. This transparency allows the emitted light to disperse evenly and uniformly without any interference. An even coating of yellow phosphor in a silicone resin binder material converts the blue light generated by the LEDs into white light. Degradation of silicone binder, and leakage of blue light are design issues in LED filament lights. Positive benefits of the LED design are potential higher efficiencies by the use of more LED emitters from lower driving currents. A major benefit of the design is the ease with which near full "global" illumination can be obtained from arrays of filaments.